Figure 16.1. "An example of net changes in ecosystem carbon stocks over time. Changes in individual ecosystem components take place at different rates, but it is the net of the changes in all interconnected pools that determines the net flow to or from the atmosphere. In the example, the accumulation of biomass initially is at a lower rate than the decomposition of the dead organic matter stock so the stock of ecosystem C declines. Later in the cycle, dead organic matter stocks may increase, although other components have reached steady state. Maximum ecosystem stocks (highest value of Ecosystem C) occur at a later time than the maximum rate of net carbon uptake (steepest slope of the Ecosystem C line)" (quoted from Kauppi et al. 2001: 308). through the landscape. These sources and sinks migrate through the landscape in the course of time. Under stable environmental circumstances, an ecosystem can sequester carbon over long time frames only if it has lost significant amounts of carbon first. This is the direct causal link between the current dynamics of the biosphere and past (human or natural) actions (Figure 16.1). Therefore, it is very important to understand and assess past dynamics if we want to estimate current and future carbon dynamics. 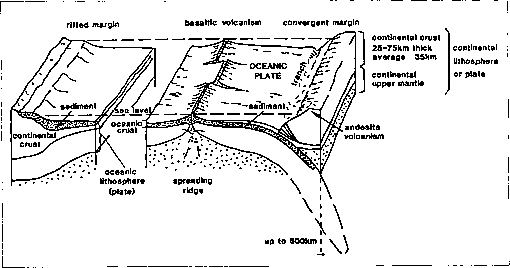 This requirement is valid from the local to the continental scale (Figure 16.2). Figure 16.2. Age class distribution of the European forests (140 million ha in 30 countries) in 1990 (bars). This distribution is the result of afforestation in the early 20th century and a certain type of management following it. Purely hypothetically the age class distribution of the European primary forests may have resembled, at some stages in time, the drawn line (possibly some 275 million ha). Thousands of years of degradation completely diminished this primary forest, while 20th-century afforestation created a forest resource as given by the bars (Nabuurs 2001). consisted of planting or reseeding after a clear-cut, followed by regular thinnings in a usually even-aged monospecies stand. Depending on the tree species, a clear-cut would follow again after some 60 to 150 years. This system made it possible for a forest owner to deliver a continuous stream of wood as a raw material to industry. This system led to the age class distribution in Figure 16.2 and has resulted in an average growing stock volume of stemwood of some 140 (cubic meters) m3 ha-1 (40 to 50 megagrams of carbon per hectare [Mg C ha-1] in total tree living biomass) and an average age of 57 years. For comparison, the average age of forests in European Russia is in the range of 80 years, while in the United States it is 76 years (Pisarenko et al. 2000; Haynes 2002). 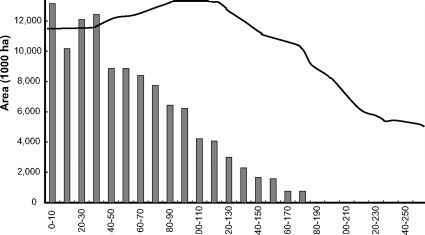 Kurz and Apps (1999) reported an increasing average age of Canadian forests to 81.5 years in 1969, after which it leveled off and slightly declined owing to increases in natural disturbances. The leveling off is what causes the sink to go away, even though the decline is very small and in the range of annual fluctuations. This high peak in the average age is very interesting. If Canadian boreal forests with regular dis turbances can reach 81 years, then European and U.S. temperate forests may be able to reach higher averages. Currently, European countries harvest 50—60 percent of the total European stem-wood increment (the latter amounting to 750 million m3 y-1) for the forest industry. The remaining additions to the growing stock, together with changes in the wood products pool and the soil organic matter pool, are usually assessed by "inventory-based estimates" to yield a current sink in European forests of around 0.10 petagrams of carbon per year (Pg C y-1). Of this, about 75 percent is in the living biomass (Nabuurs et al. 1997; Liski et al. 2002; Karjalainen et al. 2003). It should be noted, however, that estimates based on other methods differ quite a lot, although all assess a sink. Thousands of years of forest degradation in Europe, starting in Mesopotamia some 5,000 years ago, have thus laid the basis for the current and future sink potential. If we look again at the age class distribution in Figure 16.2 and assume that management will not change much, then it is clear that European forests will not return to the age class distribution of the primary forests. This thus sets a cap on the persistence of the current sink (unless the site conditions have changed). Under current management, the age class distribution will shift a bit further to the right, but not much. This shift will take place rather slowly, because forest owners will continue to log stands older than about 80 years. This owner behavior will be influenced by the future wood market, owner goals, and the current stocking and age class distribution. This perspective on the present state of the forest provides a valuable starting point for assessing the future carbon sink of European forests as well as for other regions in the world. The degree to which the current dynamics are fully controlled by past dynamics, however, in contrast to current influences, including nitrogen deposition, current weather, CO2 fertilization, and current management (changes), is much less certain (Baldocchi and Valentini, Chapter 15, this volume).